I usually reserve a portion of our Saturday mornings to bake up some snacks for us to have through the weekend. 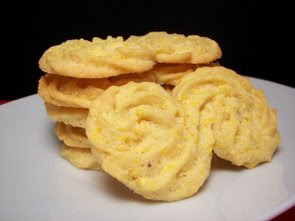 This morning was no different and once I got things together, I started working on these Italian Polenta Cookies. Rich, buttery and decidedly crunchy, these "S" shaped cookies have a high ratio of cornmeal to flour. 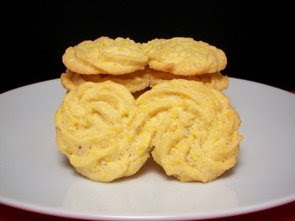 To achieve that fantastic bite the cookies have, you are looking for the more jagged and coarse yellow cornmeal for this recipe, not the fine sandy cornmeal you might normally use in baking. 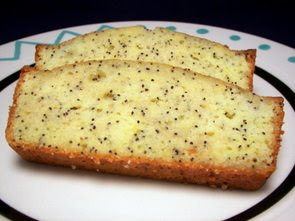 To get a full lemon flavor, without adding excess moisture to the cookie dough, we added a full tablespoon of fragrant lemon zest, utilizing the same technique we used in that Lemon Poppy-Seed Tea Cake by rubbing the zest into the granulated sugar. When the flour and cornmeal are added to the dough, it will be quite stiff with a bit of the flour mixture hiding in the bottom of the bowl. Go ahead and remove the bowl from your mixer and just use your hands to be sure that extra gets completely mixed in. Since I had some sturdy, yet disposable, large pastry bags, I went ahead and filled it with all of the cookie mixture. While it held the sturdy dough just fine, I found it was a little difficult to put enough pressure on it to allow the dough to come out nicely. Once I took about half of it out, it was so much easier - so I would suggest working in a couple batches. You may want to cover the other half to prevent any drying out of the dough. You don't have to pipe the dough into "S" shapes, you could do "O" or whatever you prefer - I quite liked the curves that this letter provided though. Because the dough is heavy, you may have problems with the parchment lifting up when you are pipping - to solve this, just squirt a little dot of the dough onto the baking sheet to give the parchment something to grab a hold of. With the high butter content, and not a lot of dry ingredients to help absorb the moisture, you will want to freeze the unbaked cookies for about half an hour to control the spreading as they sit in the hot oven. They will be baked enough when the edges just begin to turn golden - you want the centers to be still a little soft in the center as they will firm up as they cool. Because they are still soft, you don't want to try and move the cookies once they are taken out, but you don't want to leave them on the warm baking sheet either. This is where the parchment comes in handy! Gently pull the entire sheet off the pan and place it on a wire rack to continue the cooling process. Even though they are calling for an inch of snow overnight (enough already! ), I know, or at least hope, warm weather that will last for more than a day is right around the corner. I can't wait for the first time that we can pack up a little basket, head out to one of the many local parks to overdose on fresh air and enjoy a picnic! Once we prepare a recipe, it is filed in a number of ways, depending on what it was and what we thought of it. Tonight's dinner, Pacific Rim Wraps with Creamy Citrus Ginger Dressing, will definitely be heading into a file that is starting to fill up with picnic-worthy recipes. With a couple interesting ingredients, the dressing for these wraps was an intriguing mixture of evaporated milk, fresh lemon juice, canola oil, granulated sugar, ginger, along with the obligatory salt and fresh ground black pepper. For ease of mixing, the ingredients are simply thrown into a small resealable container (we used a smaller canning jar) and shaken until well combined - a perfect job if you happen to have little helpers around! I thought the dressing would have ended up a bit too sweet for our tastes, so I only used half of the sugar - but once I tasted it, I added the other half. It looked like a bit much at first, however, with the pungency from the ginger and sharp lemon juice, it is needed to maintain a balance. For the salad inside of the wraps, we first shredded up a bunch of crisp romaine lettuce and a few chicken breasts that we poached. To those, we added crunchy matchstick-cut carrots, crunchy sugar snap peas, chewy dried cranberries and a small handful of toasted slivered almonds. If you are going to serve all of this at once, go ahead and add the required amount of dressing and continue on. However, it's not like we were going to eat this all by ourselves, so I divided the dry salad mixture between a few containers and placed them in the refrigerator. This way, I can keep the dressing separate and won't have a soggy mess of leftovers to work with when we have the rest for lunch tomorrow! 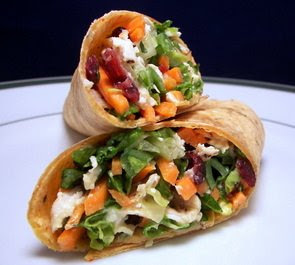 We served this by adding the dressed salad mixture to our favorite tortillas (we used the Chipotle Chile and Peppers flavored version), rolled them up and sliced them in half. With a myriad of textures, these appetizing wraps, with their unique dressing, were light, quite refreshing and I'm already counting down until we can finish the rest tomorrow afternoon! 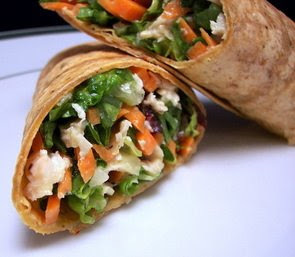 You could even take these in a different direction and make this bit lighter - how about serving the filling in a halved pita or just grabbing a fork and digging in for a delicious salad without the bread! I was at the market yesterday to pick up some ingredients for tonight's dinner when I saw there were a few bundles of asparagus that looked especially enticing and noticed they were also refilling a bin with fresh snow peas. 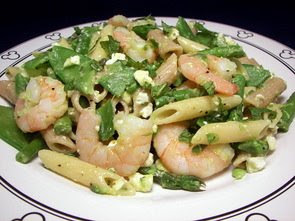 I remembered a recipe that I had set aside to make a little later in the springtime, but decided to push back tonight's scheduled dinner to tomorrow and make this Penne with Shrimp, Feta, and Spring Vegetables dish instead. This recipe even got a couple bonus points before we even got started - it is all done in one pot and can be prepared in less than half an hour! 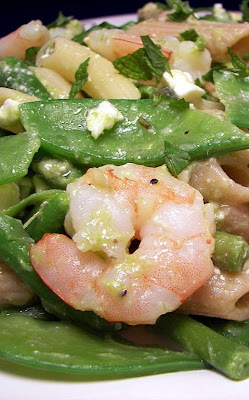 The timing for this dish will depend more on the directions from your pasta's package. Once the pasta has dropped, you want to let it cook by itself until there is about 5 minutes left before the pasta is al dente. For the whole-wheat pasta we used (I actually used a combination of whole-wheat and multi-grained pasta as we just enough of each left), the total cooking time was around 11 minutes. So, 6 minutes after the salted water had started working its magic, we dropped in the beautiful asparagus pieces. 3 minutes later, peeled shrimp and a couple handfuls of diagonally sliced snow peas are added. Before you drain away the cooking liquid, remember to scoop out about 1/2 cups worth. I try to do it this way, rather than trying to catch it as I pour it, because I've forgotten to put a bowl underneath the colander more than I'd care to remember, watching the needed starchy water go down the drain. Once the pasta and veggies are put back into the warm pot, the mixture is dressed with a few tablespoons of slick extra-virgin olive oil, fresh tangy lemon juice, a couple cloves of minced raw garlic and some of that reserved cooking liquid to add moisture. 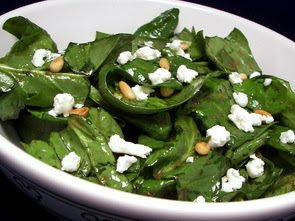 Feta crumbles are gently tossed in for a salty bite with a scattering of bright mint leaves to add a fresh burst. Besides adding protein, the tender shrimp helped keep the dish feel light and fresh - however, I think it would taste well with some shredded chicken if you don't favor seafood. Even though the garlic was raw, the stronger flavors that were added allowed it to be put into submission, so you get just enough pungent taste without it being annoyingly harsh. If you don't care for that type of flavor at all, just go ahead and toss the cloves in when you add the shrimp to mellow it out. Do you ever have one of those days where you just want to come home to a big comforting plate of mashed potatoes for dinner? Maybe it's just us and the day we had today, but the thought of having a dish like that tonight really sounded appealing. 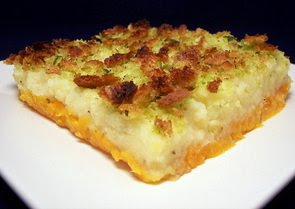 We decided to step up ordinary mashed potatoes and made this Two-Tone Mashed Potato Crisp for our meal this evening. I know it's going to all end up in the same place and it may seem overly fussy, but we did a little extra work to ensure the layers would stay distinct. This means we cooked the sweet potatoes and buttery Yukon Golds in separate pots - in the end, this was an even better idea as I found that the sweet potatoes actually cooked a bit quicker. Once the potato cubes were tender, we drained them and put them back into the hot pot (with the burner turned off!). Placing them back into the pots, rather than into a separate bowl, allows the potatoes to evaporate any excess cooking liquid so they will be nice and fluffy when you mash them. For a pleasant tang, sour cream is added with the rest of your typical mashed potato ingredients. If you think ahead far enough, take the milk, sour cream and butter out from the refrigerator to take the chill off - I find the texture of mashed taters is a bit better when the rest of the ingredients are not icy cold. An extra interesting note into both potatoes comes from a dash of fresh grated nutmeg. 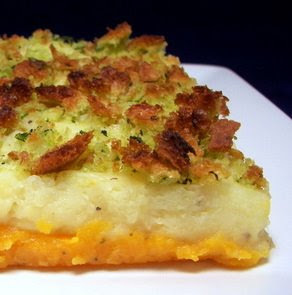 If you are so inclined, once the potatoes have been layered into the baking dish, you could stop at this point, cover and refrigerate to make these a day ahead of time. You will then want to pop the dish into a microwave for a few minutes to start the process of heating them through. Before the potatoes go into the oven, they are topped with a mixture of crusty bread, fresh parsley and melted butter that has been buzzed together in a food processor. Baked until the topping is crisped and browned, this casserole will serve best when it has cooled down slightly. You could certainly present it right out of the oven, but it will not keep its shape when you portion it out if it is still pipping hot. With the smooth distinct layers underneath the golden crust, the flavor of the potatoes did not compete with each other and melded quite well! While this was probably meant to be served as a side dish, we went ahead and just divvied it out into bigger portions, putting us into a much needed carb-induced coma. For the Weekly Wednesday Treat Day event this week, we thought that this time we should probably prepare a treat that didn't include chocolate for a change. I'm sure not everyone loves chocolate as much as we do (*gasp! *) and looking back over the past few weeks, we have been a little heavy in the chocolate department. We had decided to make a quick bread, but rather than making two of the same kind, I also threw together a tea cake in the interest of giving them options to choose from (or both if so inclined!). *Just a note, to add some nutrition, we used some whole-wheat pastry flour as part of the dry ingredients in both recipes - if you don't have this, you can just replace it with all-purpose flour. 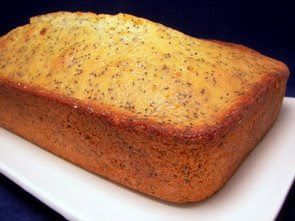 Since there were a few steps in the tea cake recipe, I decided to work on the Lemon Poppy-Seed Tea Cake first. Ever since I've been using that fantastic technique from Dorie Greenspan about rubbing zest into sugar before creaming the sugar with butter, I always try to do this extra step to maximize the zest's potential. When I was getting my list for the market together this past weekend, I had to run out to the garage to check my supply of poppy seeds. Since I don't use them all that often, I keep these crunchy, blue-grey seeds in cold storage because they can go rancid fairly quick. Once the cake was in the oven, I began working on a sweet, yet tart lemon syrup. To create this, a simple combination of granulated sugar and fresh lemon juice is brought to a boil - doing this ensures all of the grainy sugars will dissolve into the juice. As soon as the tea cake tested done, the top was littered with holes from a toothpick and almost all of the syrup is poured over the top. It is essential that this part is done while the cake is warm so it is absorbed into the cake, creating a very moist inside. After a couple hours of cooling, the cake is turned out of the loaf pan and is given a brush with the remaining sticky syrup. Waiting until cake has cooled to finish with the remaining syrup allows it to dry on the exterior, giving the crust a delicious sweet crunch. Very lemony, this zesty cake, studded with the nutty seeds, was quite the refreshing change we were looking for. 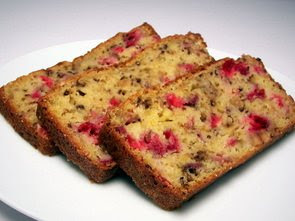 Unlike the above, this Cranberry-Orange Nut Bread I also made took very little time to prepare. There is no creaming of butter in this bread, so all you basically do is dump a bunch of ingredients into a bowl and stir them together! My main reason for choosing this recipe was to finally break into my stash of frozen fresh cranberries that have been loitering in our freezer! I've mentioned it before, but around Thanksgiving time, I make sure to buy several extra bags so we can store them in the freezer and enjoy that fresh cranberry flavor throughout the year. One flavor that is always a brilliant match with cranberries is orange. So we used freshly squeezed orange juice and the zest of said orange in this snazzy quick bread. Instead of butter for the fat, this recipe uses a combination of neutral canola oil and tangy yogurt to lend moisture and texture. If you don't happen to have yogurt handy, you could also use the same amount of buttermilk or even sour cream instead. 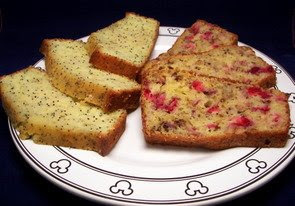 As with most muffins, cakes or quick breads that have chunky additions at the end, be sure to gently fold them into the batter with the least amount of strokes as possible. Overworking the batter can lead to rising and textural issues. You could leave the final addition to this bread with the coarsely chopped cranberries (food processors make short work of chopping! ), but we thought we would add a handful of toasted walnuts for a nutty contrast. This studded bread was soft and slightly sweet - we both loved the tart little bites of cranberry we found in each bite. I think this bread would also be great baked in mini loaves and wrapped up to give as an tasty edible gift. A new reason to bust open a bag of tortilla chips! 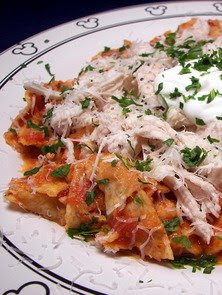 The last time we made chilaquiles, it was an effort to use up a few leftover tortillas that we had sitting in the freezer. I didn't have any extra in the freezer this time, so the recipe for these Chipotle Chilaquiles we made for dinner tonight came in quite handy! Instead of using tortillas, this speedy dish makes use of some crunchy tortilla chips! To moisten those chips, canned whole tomatoes are amped up with a couple smoky chipotle peppers and buzzed together with a bit of their juices to quickly create a sauce. To further add flavor to the sauce, thinly sliced onions and a few cloves of garlic are softened in a touch of oil. The spicy sauce is poured in and allowed to bubble away to begin adding some depth to the tomatoes. Since the tortilla chips will drink up quite a bit of the liquid, chicken broth is added to thin out the mixture. Once the chips are added, you have a couple options on how to serve this. 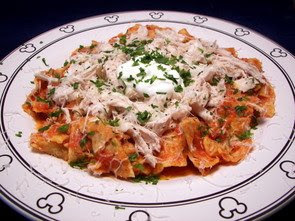 You could simply add the few raw onions that were set aside, some shredded chicken and Asiago cheese to the mixture and combine it all to make a big 'ol family-sized pot to dish out of. We went a different route - we portioned out the sauce and chip mixture, then layered the rest of the ingredients on top. To finish our plates off, we added a bright note with a scattering of fresh cilantro and placed a dollop of tangy sour cream in the center to cool our mouths down from the chipotles. If you want to lean a little more authentic, try using some Queso añejo instead of the Asiago - this is an aged Spanish white cheese that has a pleasant salty bite. Since there are only two of us here, I actually first scooped out two portions of the tomato sauce before I added half of the chips. This way, when we reheat our servings for lunch tomorrow, we can just heat up the sauce, stir in the chips and go from there. Eaten fairly soon after assembly, the chips in this dish soften just enough so they are not crunchy, but they are not soft or mushy either. I was afraid that if the dish sat in the refrigerator overnight that the chips would probably just disintegrate, leaving us with a tasty dish that might have had an unappealing texture. 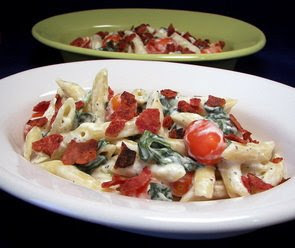 Quick penne pasta toss... with bacon! Just 7 new recipes for us this past week - we really enjoyed the White Cheese and Sausage Pasta, Potato-Rosemary Pizetta and that wicked sweet treat, Banana Split Coffeecake. We had to open up a new package of bacon on Friday so I could cook a few up to serve along side those French Toast Sticks. 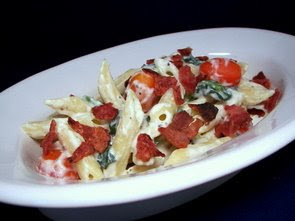 Before I snuck the rest of the package in the freezer (I like to separate the bacon, place on a long roll of saran wrap, add another piece on top and wrap up for easy access to individual pieces), I crisped up a few extra slices to make this BLT Penne Pasta Toss for tonight's dinner. To give the creamy sauce a boost in flavor, I decided to use those funky Laughing Cow swiss cheese wedges instead of the regular cream cheese the recipe called for. We've been using those soft wedges to spread on crackers for a few years now... tasty stuff! The only other ingredients the sauce contains are milk and fresh grated Parmesan cheese - these three ingredients are heated in a large skillet until the cheeses melt and the sauce bubbles and thickens. The crumbled crisp bacon is stirred in, along with tender fresh baby spinach, a cup of grape tomatoes and a sprinkling of Italian seasoning. With white sauces, especially those containing spinach, we always add a pinch of fresh grated nutmeg - you probably couldn't pick it out, but it just adds that little something special. After a few minutes of simmering, the spinach wilts and the tomatoes had ever-so-slightly softened. A mound of al dente penne is stirred in and the dish is complete. The smooth sauce had a rich mouth feel, thanks to the soft cheese, but it was not at all heavy either. One thing I might do differently is halve the tomatoes before hand - while it was quite flavorful chomping down on one of the whole pieces, the burst of liquid was quite hot (and not the enjoyable spicy kind!). 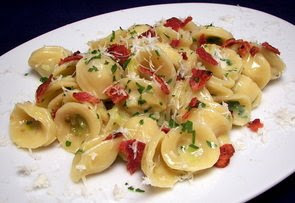 Try not to skimp on the bacon - besides adding a textural contrast to the tender pasta and spinach, the salty bite lifted up the light sauce, adding another dimension. So I was busy making yet another batch of those tasty Chicken Breakfast Sausages this morning when I heard little yaps and cries when the pups came in from doing their business outside. I first thought it was because they looked over on the kitchen counter and saw the stack of sausages. A few minutes went by and then Jeff walked the dogs through the kitchen and had them sit at my feet. Wondering what was going on, I looked down to see that their little container of homemade dog treats was also at my feet completely empty. I think someone (who will remain nameless... *cough*) has been a little extra generous in handing them out! Since it was pretty gloomy outside and we didn't have a lot planned today anyway, I went ahead and made a new batch of treats for them. We haven't prepared any cheesy goodies for them lately, so that's how these Crunchy Cheddar Oat Snacks came about. To give the oats a chance to soften a bit, we soaked them in boiling water, along with a few tablespoons of softened butter. There are a couple elements that add a crunchy factor into these treats - one of them is from the hearty addition of yellow cornmeal. To tempt the pups with more flavor, we also tossed in a couple teaspoons worth of chicken bullion (I don't even know why I had this in the pantry as I've never used it!). After some milk, an egg and a full cup of white cheddar cheese are added, we stirred in the duo of flours cup by cup. Start out with the two cups in total, but you will probably need to add more as you go while you are kneading the dough. It will be ready to be worked with when you've added enough flour so the dough is no longer sticky and kneaded long enough to become smooth. You can roll the dough as thick as about 1/2" or so, but our pups tend to like them on the thinner side, so I aimed for 1/4" thick. You can re-roll the dough as many times that you need too - if it starts to snap back while rolling, just cover it and set it aside for about 10 minutes to relax the dough. 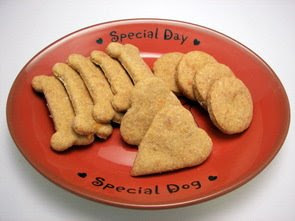 The treats are done baking when they are firm to the touch and have a good golden tinge to them. If you want them extra crunchy (good for the teeth! ), turn the oven off and partially open the oven door - leave them in the oven until they are completely cool and they are good to go! We tend to keep a portion of their homemade treats in the refrigerator and store the rest in the freezer to keep them fresh, especially since we usually get several dozen out of each batch. 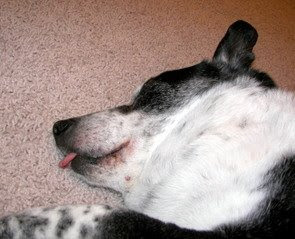 Spike was so excited he nearly fainted! 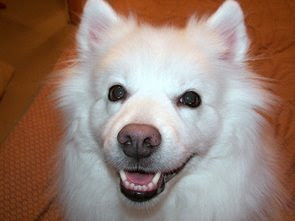 And Max was quite happy once they finally cooled off enough for him to test! Who loves breakfast-for-dinner night? We do, we do! Usually the breakfast recipes we end up preparing are no brainers and it's a nice diversion from the more labor intensive dinners we do some nights! 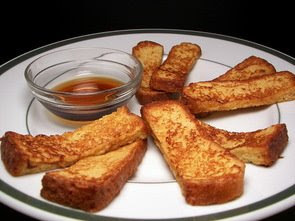 We leaned towards the sweeter side of breakfast dishes with tonight's pick of Maple-Glazed French Toast Sticks. A combination of milk, pure maple syrup, our favorite Vietnamese cinnamon, a dash of salt and a few large eggs are whisked together to create the dip the bread slices go through before being cooked in a small pool of melted butter. 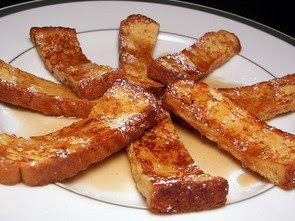 Don't forget that dash of salt in the liquids - that little bite will help calm and control the sweet syrup. So the slices wouldn't end up being too soggy after being soaked, we left the bread out overnight so it would dry out a bit. If you forget to do this part, I've been known to place the bread into the toaster oven for a few minutes to simulate the drying effect. We are big fans of the salty/sweet combo, so what else would I serve along side but some crisp bacon? As Jeff quickly figured out, the French toast sticks were just the right size to fit a piece of bacon on top to form little naughty finger sandwiches. With a few shakes of confectioners' sugar on top and a warmed individual bowl of sticky warmed maple syrup on the side, we both made quick work of our plates devouring these fun sticks. Now, you could certainly leave the bread slices whole, but I sliced the day-old pieces of bread in sticks for a simple reason - ease of dealing with the leftovers! Jeff sometimes takes a little too long between waking up and trying to get out the door in the morning, so breakfasts that can be easy to eat on-the-go are something I try to keep a supply of in the freezer. My plan is to heat them back up in the toaster oven, slip them into a cup that would fit into the drink holder in the car and dust them with confectioners' sugar - a small syrup dipper would be optional, but knowing Jeff, it would be all over his shirt by the time he drove into the parking garage... hee hee! I'm pretty sure that Jeff could live on pizza if he could and before I really got into cooking, we probably had it delivered once a week. However, now that we have been making it at home, I can't even remember the last time we ordered out! 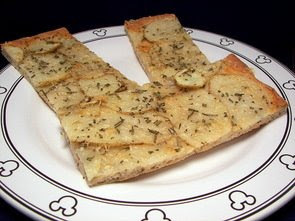 Our dinner tonight, Potato-Rosemary Pizetta, fuses a couple of Jeff's favorite foods together - pizza and potatoes! Kind of like a hybrid between a flat bread and a pizza, we modified our favorite homemade pizza dough to use in this sauce-less dish. While the original recipe did come with a recipe for the dough, we took elements from that and married it with ours. Instead of the all-purpose flour that we usually use, we swapped that out for a higher-protein bread flour and kicked up the dough by adding a tablespoon of fresh cracked black pepper and fresh rosemary. Because this is still prepared in the food processor, the dough comes together in a snap! Once the dough had risen, it was rolled out to to the size of a half sheet pan - it will be quite thin. Transferred to the pan, the dough is then stretched to fit with the edges folded up slightly to form a lip all the way around. At this point, the herb and pepper studded dough is set aside and allowed to rest until the dough looks puffy - you are not really looking for it to double in size. Paper thin slices of a large russet potato are arranged on top, followed by additional fresh rosemary and a smattering of nutty Asiago cheese. Baked until golden, we easily lifted the thin, crisp crust out of the pan without any bending or breaking when we were ready to serve it. The pairing of potatoes and rosemary was such an excellent combination, while the sharpness from the shower of cheese on top was just enough to heighten the flavors in this dish. You could, of course, use fresh grated Parmesan if you don't happen to have Asiago, but we both thought this nutty cheese brought a little unexpected element that was a nice change of pace. 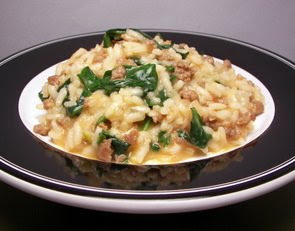 With a contrast between sweet caramelized onions and peppery arugula, our dinner tonight, Risotto with Italian Sausage, Caramelized Onions and Bitter Greens, was a wonderful way to wind down from a long day. This risotto was probably not the quickest of recipes we've done as of late, but just doing a mindless task such as standing at the stove and stirring a pot of rice was what I needed today. To speed up the process of the onions, the chopped pieces are sprinkled with a little granulated sugar once they are in the saucepan to help caramelize and bring out their natural sweetness. Once the onions were deeply golden, we transferred them to a plate and tossed in a half pound of sweet Italian turkey sausage to the same skillet and allowed it to cook through and brown. Because the onion flavor was developed into a more sweet depth, a few chopped shallots are added then tossed in to bring back a mild onion note. As with most risottos, a bit of white wine is stirred in, followed by ladles of warmed chicken broth and lots of stirring. You may or may not need all of the broth mixture - when you hit the 18 minute mark or so, be sure to start tasting the rice to check for texture. You are looking for the rice to be tender, yet still have a pleasant bite to the center of the grains. To round out the dish, bitter arugula, fresh grated pecorino Romano and lemon zest were added once this creamy risotto was ready. Arugula can be quite strong, but between the caramelized onions and salty Romano, the greens were pretty well balanced. Jeff thought the lemon zest was a little out of place for his tastes, but I thought it brought a needed freshness. It's time to take a break from those nasty taxes to do a little cake dance! For this round of the Weekly Wednesday Treat Day, Jeff thought it would be nice to bring in a fun and different cake. After describing some cakes I had in mind, we ended up choosing this Banana Split Coffeecake to make. While this two-toned cake has a few steps in it making the preparation a bit fussy, the end result was very much worth it. 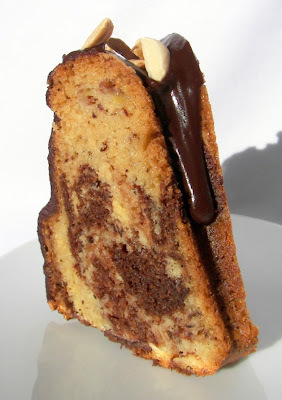 When the light golden cake batter had been prepared, a portion of the mixture is combined with slick melted bittersweet chocolate. This will form a striking contrast to the remaining batter that will be combined with a mashed banana. One tip - because there is such a small amount of banana, be sure to use the ripest one you can so you get the most bang-for-your-buck in flavor. Once this high-rising marbled cake had cooled completely, it has a couple finishing touches to really set it off. 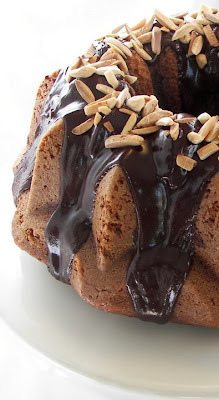 The first is a decadent chocolate glaze made by heating together bittersweet chocolate, butter, half-and-half and a touch of light corn syrup. When it was warm enough to make the mixture completely smooth, it is set aside to cool down and thicken up. Now, you don't have to add that little bit of corn syrup, but it helps ensure that the glaze will easily pour and not harden up too much. I was a little thrown off by the term "glaze" - I was expecting something that was a little more fluid. While this did flow down the cake a little, I thought it was a bit too viscous to get an even finish. 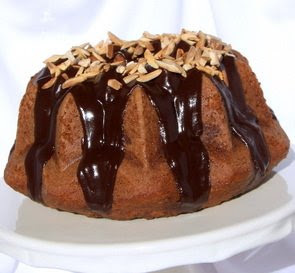 To round out the "banana split" part of this coffeecake, toasted slivered almonds garnish the top of the cake while the glaze is still wet. The combo of chocolate and banana in this cake was quite exciting - however, I would maybe think about adding a couple drops of banana extract to the blonde batter. Even though my banana was quite ripe, I just think the flavor could use the boost to stand up to the rich chocolate. Thanks to the buttermilk, the cake was very tender and moist with a delicious mild tang. You probably won't end up with all of the glaze on the cake as some will inevitably (though it may take awhile!) run down. So be sure to do this part while the cake is still on the cooling rack and just place a plate underneath to catch any drippings. The leftovers can be scooped up and stored in the refrigerator for a few weeks to use as a fantastic chocolate-y topping for ice cream when heated back up! You know we love spicy dishes by now, so I apologize if you're not a fan - you can still give most of our recipes a chance and just reduce the spices or peppers to your own tastes. However, I wouldn't tinker too much with tonight's Flank Steak with Hot Peanut Sauce as we thought the dual layers of heat worked magic for this dish. Prices for flank steak have gone through the roof it seems, so we don't enjoy it as much as we used too, but I do get a large pack from Costco every once in awhile and break it down into portions for us to store in the freezer. Fully thawed, this cut of beef is not always easy to slice into thin pieces (always against the grain please! ), so to make life a littler easier, I try to do this part while the meat is still partially frozen. 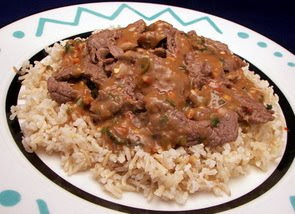 The thin strips of steak are placed into a bag containing green onions, soy sauce, brown sugar, fresh ginger, lime juice, toasted sesame oil, crushed red pepper and a couple minced cloves of garlic. Half of that same marinade is actually set aside, before the steak is added, to create the base for the sauce later on. Be sure to give the steak at least 2 hours so the marinade has a chance to do its thing - since there is very little acid in the recipe though, feel free to assemble this part the night before if you won't have time before dinner. While the skillet for the steak was coming up to temperature, we finished the peanut sauce by combining the remaining marinade with a bit of water, crunchy peanut butter and a touch of cornstarch to thicken it up. Once it comes to a simmer, it takes just a minute to activate the thickener and the sauce is good to go. Since the steak was sliced thin, it literally took just a couple minutes per side to get to a doneness we prefer. Because there was about 1/4 cup worth of sauce per portion, we decided to serve the tender strips over a nutty bed of brown basmati rice. Don't expect an intense peanut flavor as there is only a tablespoon of peanut butter in the sauce, but you could still tell it was in the mix. Between the fresh ginger and crushed red pepper, there was quite the wallop of heat in each bite, but with a forkful of rice, it was not overbearing at all. We had a total of 9 new recipes for us this past week - our stand-outs this round were those Neapolitan Meatballs, Thin Mints on a Rocky Road and the Easy Eggs Florentine with Baby Spinach and Goat Cheese dish especially as it was such a quick and tasty dish. If I can sneak in a fourth recipe though, we are still indulging (probably a little too much) in those Chocolate Espresso Snowcaps we made yesterday. It may be April and suppose to be springtime, but I think Minnesota was left out of the memo. It has been cold, very windy and we've been threatened with loads of snow - while we are thankful the snow went way north of the cities, we still got stuck with a mixture of icy rain and sleet. In an effort to warm us (and the house!) 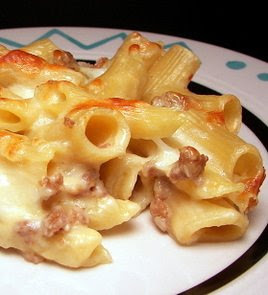 up, I prepared this comforting White Cheese and Sausage Pasta dish for dinner tonight. As the rigatoni was busy getting tender, we browned and crumbled a good half pound of hot Italian turkey sausage. Once we removed the sausage, we melted a couple nobs of butter and then whisked in a few tablespoons of flour in the same skillet. Be sure to let the flour cook out for a minute or two so it has a chance to lose that raw pasty taste. Milk is gradually whisked in and after it had a chance to bubble and thicken, we combined the sauce with the sausage, pasta, a couple handfuls of sharp Parmesan cheese and a shake or two of crushed red pepper flakes for another dose of spice. Scooped into its carriage and showered with shredded mozzarella cheese, this loaded pasta dish bakes until the sauce is hot and the top transforms into a glorious golden brown layer that got just a little crispy (my favorite part!). While there was no real explosion of flavors here, what this pasta bake gave us was a hearty, cheesy and carb-laden meal that warmed us from the inside out. I didn't necessarily need to bake anything today, but I woke up this morning itchin' to make some noise and make a mess in the kitchen. There was only one hitch though, I knew we were going to spend a good chunk of our mid-morning away from the house getting some errands done. After bouncing a few ideas off Jeff, I settled on making these Chocolate Espresso Snowcaps as the dough needed to rest in the refrigerator anyway. 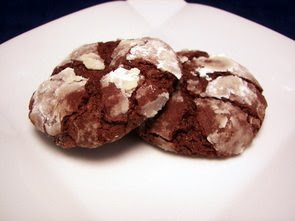 My mom has been making a version of these cookies, commonly referred to as Chocolate Crinkles, for years - these, however, are a bit more rich with a deep chocolate flavor. Since I was already using melted bittersweet chocolate in the dough, I used a dark Dutch-process cocoa powder for an intense, yet less bitter, additional chocolate layer. 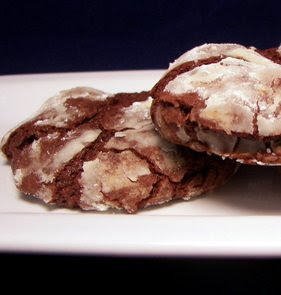 To heighten the chocolate notes, instant espresso powder is added to the dry ingredients - while it does add a coffee element to the cookies, it doesn't overwhelm the chocolate. Once the dough had chilled out in the refrigerator while we were gone (you can speed up the process by putting it in the freezer), we portioned it out and rolled the dough into balls. The next step is important - you want to give the black dough a generous double coating in powdery white confectioners' sugar (I think I could have done a better job at coating ours!). You don't want any of the chocolate color to show through as this will give you the best well defined cracks on top as they spread in the oven. The baked cookies were soft with slightly crisp edges that lead to a delicious fudgy center - Jeff said they were teetering on being brownies in cookie form. I think we both agreed that these may just have to find a spot in our Christmas baking spree 2008 list! If you have browsed through the main and side dish recipe section to the left, you'll see that we make our fair share of recipes involving some sort of meat-based protein. However, we do like to take breaks from it as it tends to help with the budget and challenges us to keep trying new combinations of ingredients. 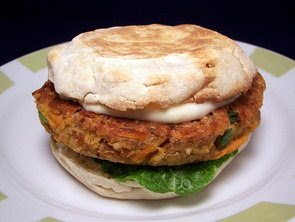 Since we just used a pound of beef to make those meatballs the other night, we opted to take a typical meat-filled burger in a different direction and prepared these Veggie Burgers with Tahini Mayonnaise instead. Rather than topping these with sauce based from ketchup or mustard, we topped these with a creamy tahini mayonnaise. Just a few simple ingredients, fresh lemon juice and tahini (sesame-seed paste), are stirred into mayonnaise to freshen up the sauce and add a nutty depth. The firm burgers we made tonight are a combination of mashed pinto beans, tender bulgur wheat, panko breadcrumbs, mild green onions, an egg to help bind, coarsely grated carrots, additional tahini to tie in with the sauce and a dash of cayenne for a devilish fire. This mixture is fairly wet, but still held together well - use wet hands when you are forming them to quell any issues of sticking. Cooking these in just a couple tablespoons worth of canola oil will allow the patties to achieve a rich golden crust - they are thoroughly cooked when they are firm to the touch. 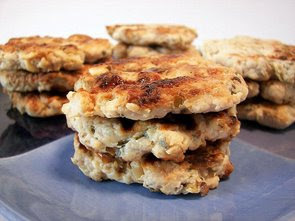 So the flavor can shine in these moist burgers, we opted to serve them inside thin toasted English muffins with some crisp romaine lettuce leaves and the tangy sauce rather than a thick, bread-y bun. I knew that I was going to be preparing a soup for the main portion of this evening's dinner, but I wanted to serve something a little different to go along side. We often make sweet muffins that we snack on or have for dessert, but we changed things up tonight with these Savory Oatmeal Muffins I made. We used white whole-wheat flour, but as usual, you don't need to run out and find it just for these muffins... you can just substitute regular all-purpose. White whole-wheat adds the nutrition we are looking for, without compromising the texture as the regular, but heavier, whole-wheat flour might do. 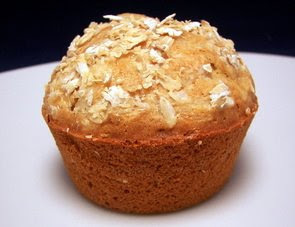 Another of the dry ingredients to make the muffins a little healthier is old-fashioned rolled oats - you can use quick oats if you don't have the thicker variety on hand, but just don't use the instant variety. While decidedly savory with ingredients like extra-sharp cheese, sage and lean Canadian bacon, these muffins do have a couple sweet aspects to them. Brown sugar and cinnamon lend an alluring sweetness, without making them seem sugary, if that makes any sense. If you like mixing up your pancakes or waffles with something savory like sausage, then these would be right up your alley. Buttermilk ensured the muffins stayed tender and quite moist - you'll notice that we soaked the oats in the buttermilk before using them. The oats don't absorb moisture quite as quick as flour, so you'll want to make sure you do this part so the batter isn't too runny. While good with the soup tonight, I think these muffins would also make for a fantastic on-the-go hearty breakfast with a quick re-heat in a toaster oven. You may remember on Monday's post that we bought some sourdough bread this past weekend for a recipe later on this week. 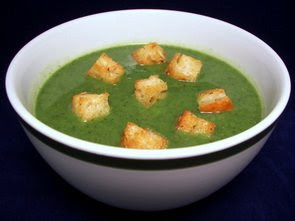 While we ended up using some of that bread for that delicious egg dish, we originally bought the bread to make croutons for this Spinach Soup with Rosemary Croutons. We cubed up some of the tangy bread and tossed it with a good extra-virgin olive oil, a clove of minced garlic and fresh earthy rosemary. Scattered in a single layer on a baking sheet, the firm seasoned cubes quickly turned crisp and golden after just a few minutes in the oven. While those we baking away, the soup was started by softening onions, garlic and again, fresh rosemary, in a pat of melted butter. Diced red potatoes (peeled or not, up to you!) are added, followed by a few cups of vegetable broth. Once the potatoes had gotten tender enough, an ample amount of fresh spinach leaves are stirred in. One note - if the spinach at the market doesn't look too inviting, try this soup with the same volume of swiss chard leaves. After a few more minutes of simmering, we pureed the soup with one of my favorite tools... an immersion blender! If you don't have this nifty tool, you could just as well use a blender or food processor - just place the soup back into the pot to warm it back up once you puree it. Jeff asked for a smooth soup, so that's what we did, but you could leave it a little on the chunky side if you want more texture from the potatoes to come through. This is quite the veggie-friendly soup as is, but if you are not concerned about that, I could definitely see topping this with a bit of crisped bacon for a smoky note. 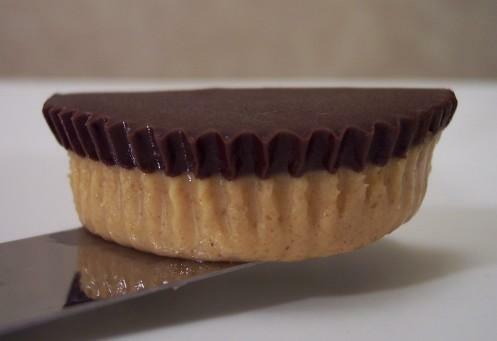 If you caught my clue from yesterday's post, you may have figured out that we incorporated some Girl Scout cookies into the treat I was making. One of Jeff's co-workers gave him a couple boxes if Thin Mints and challenged us to come up with something fun to make. Our first thought was to make those fantastic Outrageous Brownies, using the Thin Mints instead of the Oreo's. However, we wanted to do something just a little different and make a new recipe. 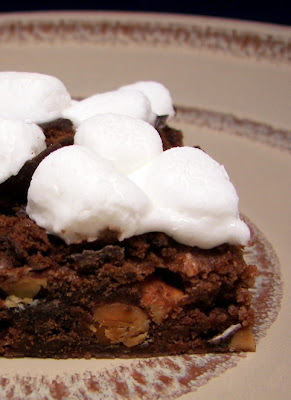 Our second thought was maybe working them into a cookie of some sort... but after talking about what we wanted the treat to be like, I ended up making these bars that we'll call Thin Mints on a Rocky Road. These turned into a dense, moist and a little crumbly chocolate cookie bar that we studded with chunky pieces of the Thin Mint cookies. Rocky Road typically has some sort of nut included, so we tossed in some roasted and salted chopped almonds for a crunchy bite. We wanted the Thin Mint flavor to stand out, so once they had almost completely baked, we scattered a generous cup of the chopped cookies over the top of the hot bars. We certainly couldn't forget about the marshmallow part, so before the pan went back into the oven, we followed up with a couple cups of the traditional squishy mini-marshmallows over the chopped cookies. 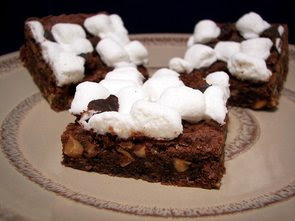 Since we wanted the striking contrast between the white marshmallows and the dark cookie, we only left them in just long enough to allow the marshmallows to expand and soften - you could let them get a little toasty and browned if you like. I was a little worried that they might be a bit too sweet, but the salted nuts and slightly bitter cocoa powder was enough to keep it under control. Just minty enough, without feeling like you just had a breath mint, these decadent chocolate cookie bars were an exciting treat and one I'll be looking forward to making again during the next Girl Scout cookie season. 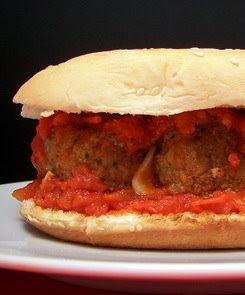 Now on to tonight's dinner - Neapolitan Meatballs! This is really just a base recipe that you could then turn and use however you like - be it over pasta, some creamy polenta or like us tonight, in a toasted sesame seed sub roll. 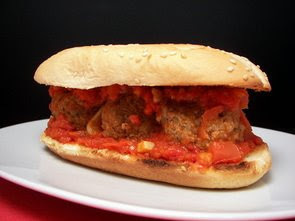 Before you begin working on the meatballs, a homemade sauce is prepared so it has a chance to start simmering. A healthy amount of thinly sliced garlic, a bit of dried oregano and crushed red pepper start out in olive oil for the sauce. Since it isn't quite tomato season yet, this sauce uses canned fire-roasted diced tomatoes with diced plum tomatoes to add a fresh background to the tinned tomato. The tomatoes are added to the softened, yet not browned, garlic and brought to a high simmer - they are then lowered down to a bare bubble, partially covered and allowed to concentrate down, partially covered, while you work on the meatballs. To bulk up and stretch the meatballs a bit, bulgur, that had been soaked in hot water and drained, is added to a mixture of ground sirloin, eggs, sharp Parmesan cheese and a surprise ingredient, cinnamon! Well, it wasn't so much a surprise to us, as we have done a couple other beef dishes that include cinnamon - it does not sound like would work, but it just adds a little sweet something that brings out another dimension. Once the balls have been formed, they are browned in a couple batches and then transferred to the sauce to finish cooking through. Before you serve this, be sure to give the sauce a quick taste for tartness - if you find it too much for you, add just a little sugar to help tone it down. This made quite a bit - 8 servings in total for us (3 meatballs + a load of sauce each) and I'm very much looking forward to storing half of these in the freezer to pull out for quick dinners or lunches! I know you've come to expect the Weekly Wednesday Treat Day goodie to be posted on Tuesdays, but I'm still working on getting the treat finished up. I'll be sure to talk more about it tomorrow, so you'll need to wait until then if you want to come back to "scout" them out. While the oven was baking the treat away, I was also busy trying to multi-task and make this Orrechiette Carbonara for our dinner tonight. I've talked about it before, but it was not until maybe 5 or 6 years or so ago that I actually started eating pasta (seriously, I don't know what my problem was!) 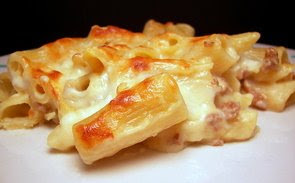 - the first recipe I actually prepared myself to see if I would even like it was actually a carbonara! Nothing like diving in head first, right? It was just a basic spaghetti version, but that night I was hooked and haven't looked back since! Feel free to use your favorite bacon for the base of this - we used one of our favorite applewood-smoked kind from our local natural foods co-op. Once the diced bacon had crisped up, we drained off all but 2 tablespoons of the intense bacon fat to begin sautéing a couple thinly sliced leeks. If you've never worked with leeks before, be sure to only use the white and pale green parts - the fibrous dark green ends are too tough to work with. Leeks can also be quite sandy or gritty, so be sure to rinse well in between the multiple layers of this veggie. 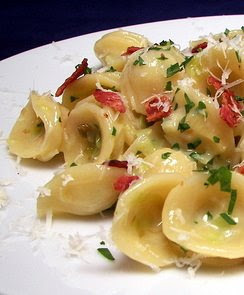 While those were getting tender, we plunked the little ears of pasta (orrechiette) into boiling salted water and cooked them just until they were tender, yet retained a pleasant bite to them. Don't forget to reserve about a 1/2 cup of the starchy cooking water before draining the pasta - I like to do this before I dump the water out because I can't count how many times I've forgotten to put a bowl underneath the colander to collect the liquid! The drained pasta is then tossed into the skillet with the softened leeks. Now, many recipes have you add the eggs and cheese right into skillet with the pasta - however, unless the temperature is just right, you may end up with little bits of scrambled egg. It won't taste bad, but you don't get that silky-smooth coating you're looking for. To help prevent that from happening, the eggs and cheese are first tempered with a bit of the hot pasta cooking water to slowly bring their temperature up. The warmed eggs are then drizzled over the pasta and the remaining heat in the skillet will finish cooking the rawness out, leaving you with a rich sauce. Finished with the crisp bacon, a smattering of fresh parsley and a bit more fresh grated Parmesan cheese on top, what more could one ask for in this pleasurable pasta dish? Mondays are typically not too busy around here, but today was an exception... by the time dinner finally rolled around, both of us were wanting something quick, yet satisfying. This weekend we picked up some fresh sourdough bread as I needed a portion of it for a recipe later on this week. Since I didn't need the whole thing, I went ahead and snuck a few slices from it to make this Easy Eggs Florentine with Baby Spinach and Goat Cheese tonight. You'll notice that I didn't put a quantity of bread in the recipe - I used a baguette, so the slices were not very wide and ended up using 2 pieces for each serving. If you use a larger sourdough loaf, one slice would probably be sufficient. 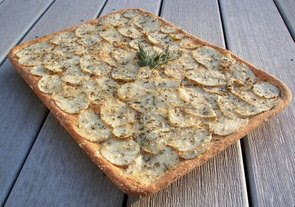 To add some additional flavor and crispness to the bread, the slices are first brushed with golden olive oil and seasoned with salt and pepper before sliding under the broiler to toast up. We then tossed a very large mound of spinach and a couple thinly sliced scallions into a warm skillet - after tossing and turning the mixture for a couple of minutes, it had wilted down and released quite a bit of liquid. I used a very large skillet and was able to fit the full pound of greens inside, but if you can't add it all at once, just add a little at a time, letting it wilt down before adding the next handful. At this point, the spinach will be almost swimming in liquid, so you want to drain as much of it off as you can - you don't need to go crazy and squeeze it dry, but do press on it with a spatula to push out some of the excess. A few ounces of crumbled goat cheese (yes, I realize that this sounds quite close to our process last night for dinner, but I assure you the end results are different!) are added to the warm greens. 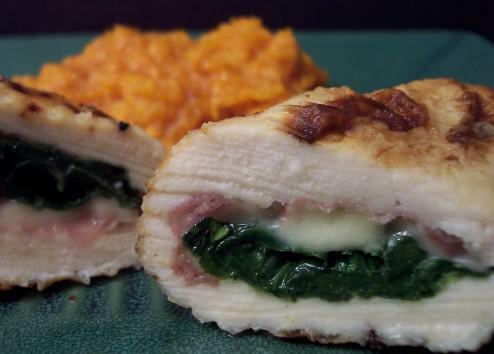 The residual heat will soften and melt the cheese, making the spinach very tangy and creamy. We transferred the wilted spinach mixture to a bowl and wiped out the skillet so we could use the same one to cook the eggs. The eggs are only on the heat long enough to begin setting the whites - they are then taken off the burner, covered and left to sit until they whites have firmed up, yet the yolk remains lusciously soft. Served as a mid-morning brunch on a lazy weekend morning or as a speedy go-to dinner like tonight, I think I'll be able to remember how to prepare this easy dish without even needing to go back to the recipe. 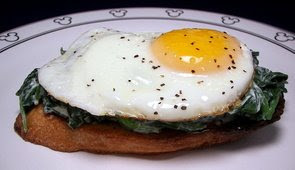 With it's crunchy, yet tender toast on the bottom, a creamy layer of greens in the middle, followed by a sunny egg on top, it will be hard to forget! A typical 9 new recipes for us this past week - our notables were those Garlic and Cumin–Seasoned Fries with Chipotle Ketchup, Toffee Almond Sandies and that Gnocchi with Asparagus and Pancetta dish. When we're looking to keep things on the lighter side, we often we have a simple protein dish, like a quick sautéed chicken breast or center-cut pork chop, and I'll make a more flavorful salad to have along side. This was one of those nights, so to have along side our dinner tonight we made this Warm Spinach Salad with Roasted Garlic Dressing. I'll preface this by saying that the original recipe did call for dandelion greens, but those have not quite hit our markets yet. So instead, I used a single bunch of spinach (not a prepackaged baby spinach) so it would have a little more heft to it. To add moisture and to coat the greens, a thick, warm dressing is on tap to be made first. Besides the sweet aroma of an apple pie or a batch of chocolate chip cookies, one of our favorite aromas that fills our house is when we have the oven busy roasting a head of garlic. You'll want a fairly large head of garlic for this recipe - if you can only get your hands on smaller heads, just use a couple instead of one. After the garlic has caramelized and softened in the oven, the cloves are squished out of their skins and pureed with a healthy dose of extra-virgin olive oil, rich balsamic vinegar and fresh lime juice. Since this is a "warm" salad, this dressing is first heated hot enough that it will begin to wilt the greens as soon as it is tossed with them. To add another layer while it is warming up, a minced shallot is tossed in to soften up with the bubbling smooth garlic mixture. 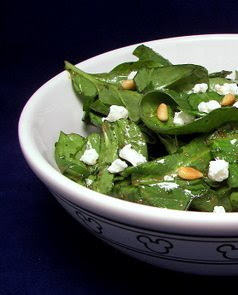 Once the spinach has been dressed, a buttery crunch is added with some toasted pine nuts. For a creamy contrast, tangy crumbles of smooth goat cheese are one of the last ingredients to be added so it ever-so-slightly melts from the heat of the dressing. The final thing this salad needed was a few grains of fresh ground or cracked black pepper. Jeff has already asked that we have this again and I especially can't wait to try it when those slightly bitter dandelion greens start popping up. It has been a fairly long time since we made some muffins and our freezer was lacking in the snack department. 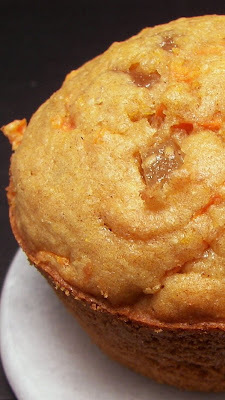 While I was waiting for the dough to rise for our favorite homemade hamburger buns, I went ahead and threw together a batch of these Ginger-Carrot Muffins. These wholesome muffins have quite the nutritious ingredient list. While we included a bit of regular all-purpose flour to ensure a stable texture, we also tossed in some whole wheat pastry flour, oat flour and ground flax seed. Oat flour is not always easy to find, but you can make your own fairly easy - just grind up rolled or quick oats in a food processor, blender or spice grinder (which is my favorite way) until it is powdery. It usually measures cup for cup, so 1/2 cup whole would equal roughly 1/2 cup ground up. You could get away with simply flavoring these with cinnamon , but to warm up the muffins, ground ginger, enticing cardamom and chunky bits of crystallized ginger are blended with the floury dry ingredients. A couple cups worth of grated carrots are folded in once the batter is combined, along with a small handful of toasted walnuts for a nutty crunch. 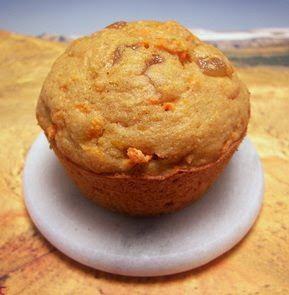 As these baked, the muffins puffed up to have beautiful crowns and a rich golden exterior. You can see that we left our ginger pieces fairly large to get that extra punch of sweet and heat, but feel free to mince it instead for a more subtle and dispersed flavor. Don't forget that muffins, especially ones like these, will freeze well and thaw in a snap for those quick snacks or breakfasts on the go! Not quite for us, but might be right for you? Woo... I think we're in a heat wave! It got up to 60 degrees - I saw so many people out in shorts and tank tops today! Funny how people do that now, but if it was the fall after the humid hot summer, they would be shivering with pants and long sleeve shirts on. I'm slightly torn about our dinner tonight... I didn't hate it or anything, but it just did not taste like I had pictured in my mind after reading through the recipe (am I the only one who does that?). 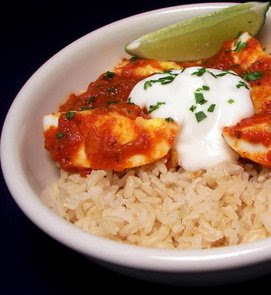 I think it was the combination of ingredients in this Curried Eggs with Rice dish that threw me off. While a hearty portion of nutty brown basmati rice bubbles away, an onion - halved and thinly sliced - is softened in a couple tablespoons of canola oil. A mound of minced garlic and fresh ginger are tossed in and stirred around for just a minute to perk up. Fragrant curry powder is added, followed by marinara sauce and hard-cooked eggs that had been quartered. At this point, things looked and smelled great... however, my taste buds were confused and I was not sure what to make of it. I continued on, warming the sauce and eggs back up, and served the tomato-y combination over the fluffy rice. We finished plating the dish with dollop of tangy plain yogurt and a slice of lime to squirt on top before eating. Jeff and I thought the interaction between the red sauce, eggs and curry powder was just a little too unusual for our tastes. I also think the texture of the eggs didn't jive with us in this combination - if you are used to these flavors together though, this might be up your alley! We are still playing it fairly safe in the seafood department, but we made a little more headway tonight! 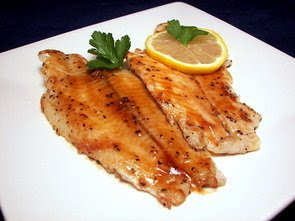 After this evening's dinner, Malaysian Barbecue-Glazed Flounder, we are able to add one more recipe to the list! We've been having fairly good luck with flounder lately, so I used that again instead of Halibut as the original recipe called for - any of your favorite firm white fish would be a good choice I think. The fillets were first lightly seasoned with salt and pepper, then quickly sautéed until the fish began to easily flake with a fork. When the fish was almost cooked through, we prepared the "barbecue" glaze - this zippy mixture is a combination of fresh lemon juice, orange juice, honey, rice vinegar, hoisin, sambal oelek and fish sauce. For a bit of body, cornstarch is also added - as soon as the sauce comes to a bubble, it is only left on the heat for a few seconds to activate the thickening power of the cornstarch. This mixture is then brushed on each of the fillets right before serving. This doesn't have that rich, robust and smoky depth that you would expect with barbecue - however, the hoisin sauce does mimic some of that. Very bright and clean with the honey, along with the fresh lemon and orange juices, the sweetness in the shiny glaze is tamed by the sharp vinegar and heat from the sambal oelek (chile sauce with garlic). I was a little afraid that the pungent sauce might overwhelm the delicate fish, but we found that the flounder held its own and didn't get lost underneath the barbecue.